With the passing of King Edward VII in 1910 a new sixpence series began in 1911 that featured the effigy of the new King George V.
Coins were initially minted in the London mint (1911-15) until Australia's Melbourne and Sydney Mints came on line in 1916 & 1921 to assume coinage production. 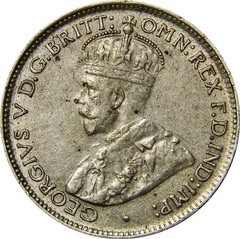 The obverse, designed by Sir E. B. MacKennal, features the bust image of King George V facing left. On the outer periphery are the words "GEORGIVS V D.G. BRITT : OMN : REX F.D. IND : IMP" (latin for "George V, by Grace of God, King of all the Britons, Defender of the Faith, Emperor of India"). The reverse, designed by W.H.J. Blakemore, features the Australian Coat of Arms (also referred to as the Commonwealth Coat of Arms) based on the design granted by King Edward VII on 7 May 1908. The coat of arms features an emu and kangaroo flanking a shield under a seven pointed star all over a banner with the legend “ADVANCE AUSTRALIA”. On the outer periphery is the denomination “SIXPENCE” and year of issue. 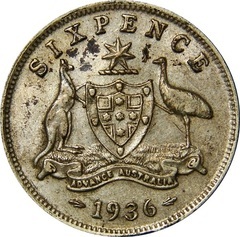 On some issues, below the date, may be a mint mark “M” for Melbourne though the Melbourne mint mark would cease after 1920. Interestingly, Australia's Coat of Arms was modified and granted by King George V in 1912 but the mint continued to use the original coat of arms from 1908. Excluding proofs, the key to the series is the 1918M issue and the semi-keys are the 1912, 1916M, 1920, 1922, and 1924 issues. For a potential sleeper look for 1935 issues with a mintage of 392,000.